Russian manned lunar expedition. Development begun in 1964. All hardware was test flown, but program cancelled in 1974 due to repeated failures of the project's N1 launch vehicle. Status: Cancelled 1974. Gross mass: 95,000 kg (209,000 lb). The Soviet system, consisting of the LOK Lunar Orbiter and LK Lunar Lander, that was to have beaten the American Apollo program to the moon. The L3 design authorized for development in August 1964 was supposed to be capable of accomplishing the mission in a single N1 launch. The late start - over three years after Apollo - and delays in development of the spacecraft and booster meant that the Soviets were still years behind when Apollo 11 made the first moon landing in 1969. Charged with fulfilling the Party's orders, rather pointless testing of L3 components continued, but by 1972 any Soviet manned lunar landing would have used the more capable L3M. On 3 August 1964, Command number 655-268 issued by Central Committee of Communist Party gave Korolev the objective of putting one man on the moon and returning him safely to earth - ahead of the Americans (who had begun over three years earlier, in April 1961). To achieve this aim a large part of the industry had to be mobilized. It would require design of what was designated the L3 complex, with the combined launch vehicle/spacecraft termed the N1-L3. The L3 would utilize the same lunar orbit rendezvous method to achieve moon landing as was selected for the Apollo program. By upgrading the N1 from a 75 metric ton to a 95 metric ton payload capacity it was felt possible that a single N1 launch could accomplish the mission. The L3 complex itself, with a total mass of 95 metric tons, would consist of a fourth stage (Block G) for the N1 to take the L3 from low earth orbit to trans-lunar trajectory; an LOK lunar orbiter with a Soyuz re-entry capsule for return to earth; an LK lunar lander for the landing of a single cosmonaut on the surface of the moon; and a Block D deceleration stage which would brake the L3 complex into low earth orbit and then take the LK lander to near zero velocity above the surface of the moon. The N1-L3 complex was designed not just for a quick initial moon landing, but also for exploration of the moon and near-lunar space for both scientific and military purposes. To measure the physical characteristics of near-lunar space and the lunar surface. To place in orbit around the moon and on the surface high precision automatic and manually-operated scientific equipment. To conduct detailed photo-reconnaissance of the lunar surface from lunar orbit. To conduct research and determine the most effective means for exploiting the moon for military purposes. The Block G stage burned to propellant depletion, putting the complex into translunar trajectory. The Block G then separated. During a 3.5 day translunar coast the Block D stage would perform two mid-course corrections. It then would put the LOK/LK/Block D stack into an equatorial elliptical lunar orbit. The Block D would be restarted twice to adjust the orbit, first to a circular 110 km orbit, then to bring the pericynthion down to 14 km. The Block D could restarted for up to 4 days in lunar orbit. The LK pilot-cosmonaut would spacewalk from the LOK to the LK and check out the lander and Block D systems. The LK/Block D then separated from the LOK. As it approached the landing site, the Block D then began its main burn and braked the LK to 100 m/s at four kilometers above the lunar surface. The Block D then separated and crashed on the moon. The LK ignited its engines and hovered to a precision piloted soft landing on the surface. The LK cosmonaut would exit the LK to the lunar surface. From six to 24 hours would be spent on the lunar surface. The LK Lunar Cabin and Block E ascent stage launched itself from the LK landing gear (LPU) into lunar orbit. It rendezvoused with the LOK and docked using the 'Kontakt' docking system. The LK cosmonaut spacewalked from the LK back to the LOK with the lunar samples. The LK was then cast off. After up to one additional day in lunar orbit, the LOK's Block I engine would put the LOK into trans-earth trajectory. 3.5 days was to be spent on the coast back to earth with two midcourse corrections en route. Before re-entry, the descent module separated from the LOK with the two cosmonauts aboard. It re-entered the earth's atmosphere over the South Pole at 11 km/sec, skipped back out to space after slowing down to 7.5 km/s, then soared 5,000 km before making final re-entry and landing on the territory of the USSR. Total mission time was to be 11 to 12 days. OKB-1 (Korolev): General management, design of Blocks G and D, design of the engines for Block D, L, and LOK. OKB-586 (Yangel) - the LK lunar lander and the engines for the lander Block E rocket stage. The LK as designed had a mass of 5,560 kg, with the Block E stage weighing 2,950 kg. Takeoff mass of the LK was 3,800 kg. OKB-2 (Isayev) - the complete propulsion system (tanks, controls, engines) for the LOK lunar orbiter Block I stage. Saturn Factory (Lyulka OKB) - 40 metric ton thrust engines for the Blocks G and V. They would also work with OKB-1 in design for the 8.5 metric ton thrust Block D engine, derived from the third stage engine developed for Korolev's GR-1/8K713 FOBS missile. By September 1964 construction began of the first N1 launch pad (LC110R). On October 13, while Voskhod 1 was in orbit, Khrushchev was removed from power and Brezhnev's faction assumed control of Politburo. The advance design project for the N1-L3 was completed in collaboration with Kuznetsov's OKB-586 on 30 December 1964. The decree for production of 16 shipsets of spacecraft and boosters was issued on 26 January 1965. The N1-L3 was to manufactured to the following schedule: 4 in 1966; 6 in 1967; and 6 in 1968. The plan was for the first launch of the N1 to be in the first quarter of 1966, with the first lunar landings in 1967 to 1968, ahead of the American goal of 1969. On January 14, 1966 Korolev died in Moscow during colon surgery. His successor, Mishin, did not have the forceful personality and political connections of the original Chief Designer. Korolev also had a legendary ability to motivate his staff and cajole co-operative design bureaus to prioritize work for OKB-1 that Mishin was never able to duplicate. The project continued. In February 1966 construction started of the second N1 launch pad (LC 110L). By November the first N1 hardware arrived at Baikonur and construction of the 1M1 full-size mock-up of the launch vehicle began. On 16 November 1966 another Keldysh-headed expert commission considered the state of the program. With Korolev dead, once again Glushko, Chelomei, and Yangel advocated development of the UR-700 or R-56 in lieu of the N1. Chelomei, smarting from cancellation of his LK-1 project, offered an LK-700 direct flight manned lander in lieu of the L3. While it was agreed that engine development and studies of these alternate approaches could continue, the February 1967 government decree approved Mishin's draft plan for the first lunar landing. This integrated L1/L3 project plan indicated a landing on the moon by the end of 1968 - still ahead of the Americans. The N1 test plan envisioned third quarter 1967 as the beginning of flight hardware construction. The first N1 launch was still set for March 1968. A moon landing would not come until the third quarter of 1969 at the earliest. In February assembly of the first N1 began at the Progress plant in Samara. By the end of summer the first N1 launch pad (LC110R) was completed. Assembly of the first 1M1 mock-up was nearing completion at the MIK assembly building at Baikonur. In September 1967 the EU-28and EU-29 test models of the second and third stages began hot firing tests on their test stands at Samara. On 25 November 1967 the 1M1 mock-up was first erected on LC-110R. A decree in November had recognized yet further slips in the schedule, with a first flight test of the vehicle not expected until the third quarter 1968. By March 1968 it was recognized that no Soviet manned lunar landing would take place until 1970. On May 7, 1968, N1 booster 4L was erected at launch complex 110R. Under its shroud was the 7K-L1S spacecraft. This modification of the 7K-L1 circumlunar Soyuz incorporated the Isayev forward propulsion module that would be used on the LOK and LK. A mass model representative of the LK lander was also included. A September 1968 flight test was planned. However the first stage oxidizer tank developed cracks during ground tests, and 4L was removed from the pad in June 1968. It had to be scrapped and improvements made to 3L, the next vehicle. The first N1 countdown began in January with the roll-out of 3L to the pad. Finally, on February 21, 1969, N1 serial number 3L rose into the sky, thundering over the roofs of the assembly worker's apartments as they cheered it on. But immediately after launch a fire broke out in the tail compartment. The engine monitoring system detected the fire, but then gave an incorrect signal shutting down all engines at 68.7 seconds into the flight. The vehicle was destroyed by range safety 1.3 seconds later. The SAS escape tower worked as designed and the 7K-L1S capsule was recovered. Against this failure, the Apollo program was achieving success after success in bimonthly missions. While beating the Americans to a moon landing was now clearly impossible, a dual unmanned mission was devised, which, if successful, would have stolen a little of the American's thunder. The plan was for the next N1 to launch an unmanned 7K-L1S spacecraft on a loop around the moon. It would take multi-spectral photographs of the lunar surface and far side. Meanwhile, a Proton rocket would launch an unmanned Ye-8 soil return spacecraft. This would soft land on the moon, deploy a core drill which would take a small sample of lunar regolith. Deposited in a small spherical re-entry capsule, this then would automatically be returned to earth. N1 vehicle 5L was launched on July 3 1969, just two weeks before the Apollo 11 first moon landing. It was a catastrophe. 5L already began to fail at 0.25 second after lift-off when the oxidizer pump of engine number 8 ingested a slag fragment and exploded. A fire ensued as the vehicle climbed past the top of the tower. The KORD reacted and engines were shut down in pairs until the acceleration dropped below 1 G; then the vehicle began to fall back to the pad at a 45 degree angle. The escape tower fired at the top of the brief trajectory, taking the L1S descent module away from the pad. 5L exploded with the force of a small nuclear bomb, destroying launch complex 110R. To compound the failure, the Ye-8 robot made it to the moon but crashed onto the surface as the Apollo astronauts rested after the first moon walk. 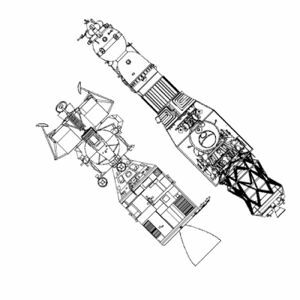 1969-11-28 - Soyuz 7K-L1E s/n 1 - Attempted test flight of Block D upper stage in N1 lunar crasher configuration. Launch vehicle first stage failed. Mission flown successfully over a year later as Cosmos 382. 1970-11-24 - Cosmos 379 - T2K s/n 1: LK moon lander test in earth orbit using T2K version (landing legs deleted, instrumentation added) launched by a Soyuz-L launch vehicle. In demonstration of lunar landing and ascent maneuvers, first went from 192 km x 233 km orbit to 196 km x 1206 km orbit, with a delta V of 263 m/s representing the hover and landing maneuver after separation from the Block D. It them simulated the ascent maneuver to lunar orbit, going from a 188 km X 1198 km orbit to a 177 km X 14,041 km orbit with a delta V of 1,518 m/s. No significant problems encountered. 1970-12-02 - Cosmos 382 - Soyuz 7K-L1E s/n 2K - Test of Block D upper stage in its N1 lunar crasher configuration in earth orbit. The three maneuvers simulated the lunar orbit insertion burn; the lunar orbit circularization burn; and the descent burn to bring the LK lunar lander just over the surface. Payload was a modified Soyuz 7K-L1 circumlunar spacecraft, which provided guidance to the Block D and was equipped with television cameras that viewed the behavior of the Block D stage propellants under zero-G conditions. Maneuver Summary: 190 km x 300 km orbit to 303 km x 5038 km orbit, delta V 982 m/s; 318 km x 5040 km orbit to 1616 km x 5071 km orbit, delta V 285 m/s; 1616 km x 5071 km orbit to 2577 km x 5082 km orbit, delta V 1311 m/s. 1971-02-26 - Cosmos 398 - T2K s/n 2 - Second LK moon lander test using T2K version. Maneuver Summary: 189 km x 252 km to 186 km x 1189 km orbit, delta V 251 m/s; 186 km x 1189 km orbit to 200 km x 10,905 km orbit, delta V 1320 m/s. No problems encountered. 1971-06-26 - N-1 6L - Failure of N1 serial number 6L. This substantially improved vehicle began an axial rotation after lift-off. Due to gas dynamics interactions of the thirty engines with the air slipstream, the launch vehicle developed a roll beyond the capability of the control system to compensate. and began to break up. Control was lost at 50.2 seconds into the flight and it was destroyed by range safety a second later. No functional payload was carried. 1971-08-12 - Cosmos 434 - T2K s/n 3 - Final LK moon lander test using T2K version. Maneuver Summary: 188 km x 267 km orbit to 190 km X 1261 km orbit, delta V 266 m/s; 188 km x 1262 km orbit to 180 km X 11,384 km orbit, delta V 1333 m/s. No problems and Yangel was said to have died soon thereafter content that he had done his part for the program. 1972-11-23 - N-1 7L - Soyuz 7K-LOK / LK Mock-ups - Perhaps only flight test of 7K-LOK lunar orbiter. By this time it was just surplus hardware. N1 vehicle represented the later N1F configuration, except for the use of the original engines. The rocket's first engines ran 106.93 seconds, only seven seconds before completion of first stage burnout. Programmed shutdown of some engines to prevent overstressing of the structure led to propellant line hammering, rupture of propellant lines, and an explosion of engine number 4. The vehicle was destroyed by range safety. By 1972 any thought of using the original N1-L3 hardware for a manned lunar mission had been abandoned. Instead it was planned to surpass the Americans after the Apollo flights were completed. This would be accomplished by flying N1M-L3M long-duration manned lunar landing missions and establishing the DLB lunar base. Russia: The Real Moon Landing Hoax How the Soviet Union fooled the world into believing it wasn't in the moon race. Family: Lunar Bases, Moon. Country: Russia. Spacecraft: LK, Soyuz 7K-LOK. Launch Vehicles: N1, N1 1969. Stages: N1 Block D. Agency: Korolev bureau.